London: Ward, Lock & Co.
Sir Arthur Conan Doyle (1859-1930) descended from a family of illustrators, including grandfather John Doyle (b.1797), uncles Henry (b.1827) and Richard (b.1824), and father Charles (b.1832). Arthur’s uncles helped fund his early education, paving the way for his future medical studies at Edinburgh. This education shaped the characterisation of Sherlock Holmes; A Study in Scarlet marks the first appearance of this legendary detective. Doyle made several unsuccessful attempts to publish this work before it finally appeared in Beeton’s Christmas Annual in 1887. The following year it was published in book form, featuring six illustrations by his father. 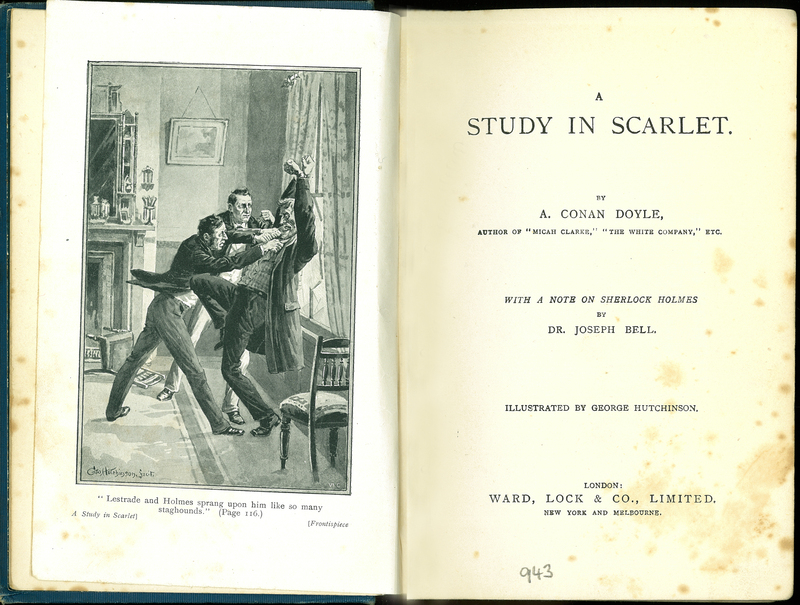 Arthur Conan Doyle, “A Study in Scarlet,” ourheritage.ac.nz | OUR Heritage, accessed April 26, 2019, http://ourheritage.ac.nz/items/show/10210.